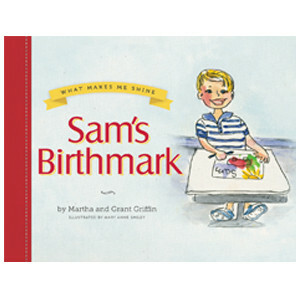 For each hardback copy of Sam’s Birthmark you purchase, we will automatically include a complimentary copy for you to give to a local library, doctor’s office, school or friend. If ordering 1 copy, you will receive 2 copies. If ordering 2 copies you will receive 4 copies. Sam’s Birthmark is a heartwarming story about a boy with a birthmark. Through Sam’s story children learn how every child in the world is unique and special in their own way.